Have you ever looked at a home and wondered how they make it look so good?! There are many ways to increase home value, that are inexpensive and simple. 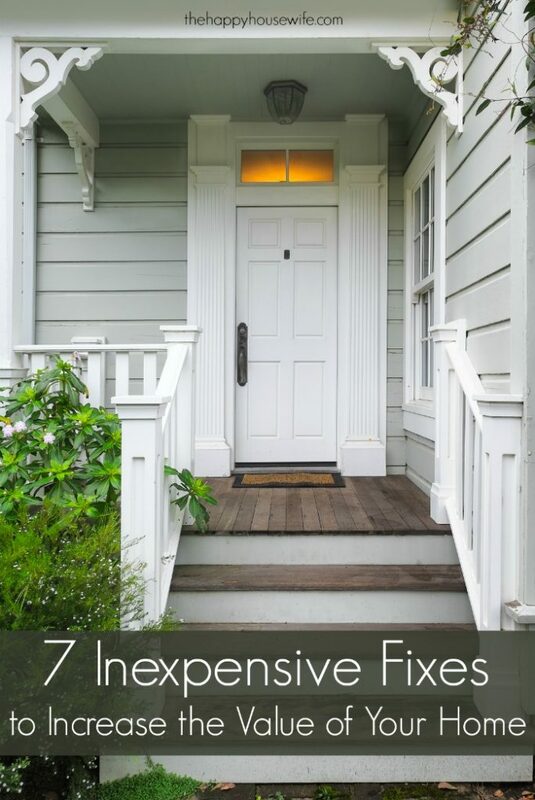 It always amazes me how fixing the smallest things can increase the value of your home. Even if you don’t plan to sell your home, small home improvements will increase the value of your home and if one day you do decide to sell, you’ll have less work to do to get it ready. Not sure where to get started? Check out these tips! Increase home value by ripping out old shrubbery. Say goodbye to ugly landscaping and hello to increasing your home value. Ripping out old shrubbery helps your house look not-so-ugly. While you are ripping up the shrubs remember to lay down some new mulch in the beds. Mulch is very expensive (especially in the spring when Lowe’s and Home Depot run their yearly sale) and can really make the outside of a house pop! I always lay down some weed blocker fabric in the beds to keep the weeds at bay. It’s inexpensive invisible when covered by a layer of mulch or stones. Improve curb appeal by removing clutter from the outside of your home. When you drive past a home that has a lot of clutter on the outside, it makes you wonder about the inside. Remove the clutter and increase the value of your home. We do a yard clean up several times a year and everyone works for a few hours getting rid of sticks, dead plants, and random things that have migrated into our yard. It’s amazing how much better it looks after only a few hours of work. Increase home value by adding a fresh coat of paint. It’s sad to see how quickly walls become dirty and gross at my house. However, a quick coat of paint can guarantee an increase in home value. Check out my $60 total room makeover from several years ago. Painting is a home improvement you can do yourself in a day and is very inexpensive. If you want to really make your room pop, clean and/ or paint the trim. It’s amazing how incredible a room looks with fresh white trim. Improve first impressions by minimizing the clutter inside. If you are trying to sell your home, having less on the inside always seems to do the trick. Start getting rid of items you no longer need and keep the inside looking tidier. This is a great way to start your journey to minimalism. Every time we’ve sold a home we’ve done a major declutter. I always wish we did it while we were living there rather than when we are moving, because I enjoy my home so much better with less stuff! Not only will your house look better, you will be able to find the things you really do need! Increase home value by updating the bathroom. An old (and dingy) bathroom can decrease the value of your home, especially if other homes in your neighborhood have been renovated. A total bathroom remodel is expensive but you can make some inexpensive changes that have a big impact. If the overall bathroom is ugly, you may have to spend some money updating the floors or painting. However, there are small things you can do to make your bathroom look awesome. Try adding a rug, scrubbing the walls, or even adding a few hand towels. If you want to make a bigger impact, consider changes the vanity mirrors or lighting, or replacing the faucets with an updated style. We purchased a bathroom faucet on Amazon for around $50 and installed it ourselves. Just removing the fifty year-old faucets made a big difference. Another home improvement we made in our bathroom was to install peel and stick vinyl plank tile over the existing fifty year-old floor. The results were amazing and it cost under $100. If you want to invest a little more money into your bathroom consider having your tiles or tub painted or reglazed. If the tile is in good shape, painting or reglazing the tile is about 1/10 of the price of replacing it. We recently painted the tile in two of our bathrooms and have been pleased with the new look. All these bathroom improvements will increase your home value and are significantly cheaper than a complete bathroom renovation. We renovated our bathroom for under $200 when we moved into our most recent home. Improve rooms and closets by adding organization features. 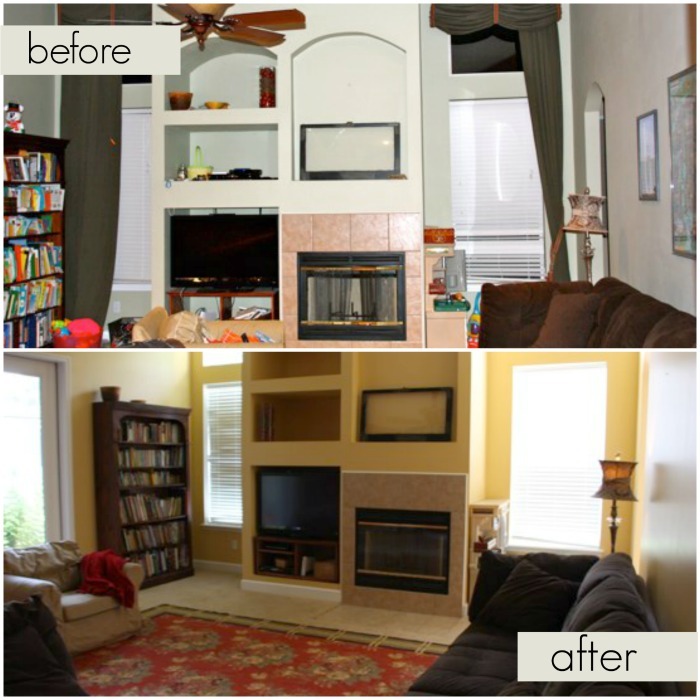 One of my favorite ways to increase the value of a home is more organizational space. People love storage! Adding something like a closet to your home is cheap. You can also buy closet organizers or closet systems to help you get that space you’re looking for. When all else fails, adding shelves is a great idea to help you get those features. 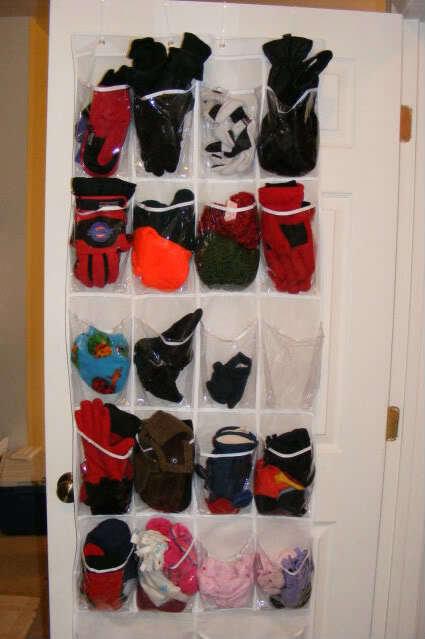 One of my favorite organizing tools is the inexpensive over the door shoe organizer. We’ve used it for Barbies, toddler clothing, sewing supplies, underwear, socks, and my favorite use – winter/ summer gear. The nice thing about this storage container is that you can fold it up and pack it away if you aren’t using it. Increase home value by updating the flooring. Hardwood flooring has always been popular. If you have an older home, you may have hardwood flooring underneath. If you don’t want hardwood flooring, you can still update the flooring in your home in an inexpensive manner. If your carpet old, stained or outdated? Add a throw rug on top of it to take the attention off the carpet. If replacing the flooring is not in the budget, have the carpets cleaned at least once a year. This really makes a difference if you have pets. Most carpet cleaning companies run specials all the time, so it’s easy to find a good deal on having your carpets cleaned. One flooring style that is very popular now is vinyl planks. It’s significantly cheaper than hardwood (although more expensive than carpet) and very durable. 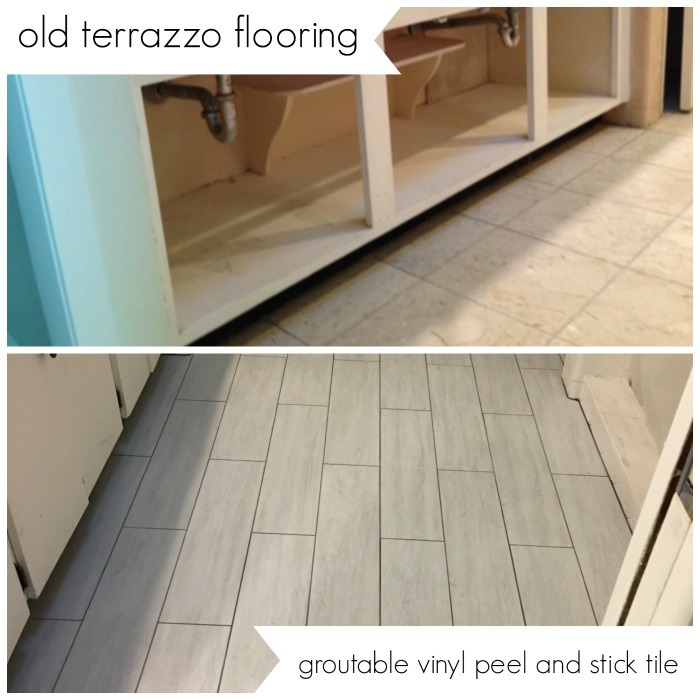 There are even peel and stick vinyl planks that you can grout to look just like porcelain tile or hardwood. If you really need to replace floors but have a small budget, vinyl planks might be a good option. These vinyl planks were installed right over the existing tile flooring. Before you tackle a huge home renovation project, think about what small projects you can do around your house that will make a big difference. Most of these projects increase home value and can be completed in a day (or a weekend). The impact is big, however the cost and time commitment is small.